If you’re reading this post, you’re probably familiar with the issue of the underrepresentation of women in science, technology, engineering, and math (STEM). You probably also know that a more diverse set of problem solvers actually engenders innovation and creativity—not to mention team and organizational success. Recently I joined Pearson and learning leaders from higher education, K–12, and industry to discuss strategies for closing the gender gap in STEM. I was asked to share some of the key motivators our development team uncovered for engaging girls in STEM. From my presentation, “Pathways, Not Pipelines,” here are six things educators, industry leaders, and parents can do to ignite STEM interest in girls. Change our point of view—and language. Let’s stop using the pipeline analogy to frame the problem of employer need. Instead, let’s talk about how we increase student interest and readiness for STEM education and careers, especially for girls. Pipeline language implies that girls are an untapped raw material needed to meet workforce goals. Instead, let’s frame STEM as a pathway to achieving the goals of girls. Help her try out her STEM skills on real problems. Teachers can leverage project and problem-based learning approaches to better engage students in their classroom—and research suggests this is especially effective for girls. In fact, we found nine out of ten girls in our study wanted to understand why they were learning about a topic, and eight out of ten girls said they were motivated to learn when they could solve real-world problems. In the case of our Spark 101 Interactive STEM Videos, employers provide the real scenarios for the problem-based learning in the classroom. Help her see STEM as useful. According to multiple studies, STEM usefulness is the most powerful motivator for girls. Educators and employers can encourage young women to look at STEM as it relates to their lives, learn what they care about, and articulate how they want to make an impact. Make her feel welcome. Employers can help girls see that women work in social, collaborative STEM environments where their opinions and ideas are valued. Make her feel capable. Let’s break down stereotypes and instill a growth mindset in all students that success comes from working hard rather than being “born smart,” and that girls and boys are equally capable of succeeding in science and math. Help her navigate the pathways between academic coursework and specific careers. Unfortunately, the path from here to there is not always clear for all students. Once inspired, girls need maps that identify specific careers and the coursework and credentials that can get them there. 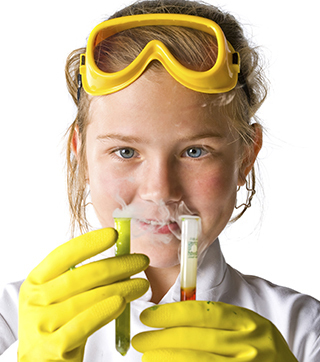 ← Blog Post: Science Testing Is Over—Now What?